Plant a tree in memory of William "Bill"
Saint Albans Bay – William Robert Lang a lifelong resident of the area passed away Tuesday, January 29, 2019, at the Northwestern Medical Center with his family at his side. Born at home on February 25, 1934, he was the son of the late William Hallie and Cora (Sherrer) Lang. Bill was 84 years old. On May 11, 1957, he married Betty Waine, who predeceased him on May 7, 2016. They were married for 59 years. Bill was a 1951 graduate of Bellows Free Academy and then served his country in the United States Army. For a short period of time he was road commissioner for the Town of St. Albans. Bill was a longtime machinist with the Central Vermont Railway. He was a very active member of the St. Albans Bay United Methodist Church, where he served on the Board of Trustees and sang in the choir. 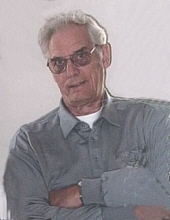 Bill was an avid outdoorsman, whether hunting or fishing, he particularly enjoyed ice fishing, was an accomplished woodworker and well known as an enthusiastic story teller. Survivors include his brother, Arnold Lang and his wife, Marjie, of St. Albans; his sisters, Eleanor Shepard and her husband, Ron, of St. Albans Bay and Norma Bushey of Lyndonville and several nieces and nephews. In addition to his parents and his wife, Betty, he was pre-deceased by his brother-in-law, Leonel “Buck” Bushey. Relatives and friends are invited to attend calling hours on Friday, February 8, 2019, from 4:00 to 7:00 PM at the Heald Funeral Home, 87 South Main Street, St. Albans. A funeral service will be held on Saturday February 9th, at 2:00 PM at the St. Albans Bay United Methodist Church, Lake Road, St. Albans Bay with the Reverend Dr. James Koo and former Pastor Elizabeth Griffin officiating. Prayers of committal and military honors will be held later this spring at the St. Albans Bay Cemetery. Those planning an expression of sympathy are asked to consider the St. Albans Bay United Methodist Church, P.O. Box 116, St. Albans Bay, Vermont 05481 or to a charity of one’s choice. To send the Lang family a message of condolence, kindly go to his on-line guest book at www.healdfuneralhome.com. To plant a tree in memory of William "Bill" Robert Lang, please visit our Tribute Store. "Email Address" would like to share the life celebration of William "Bill" Robert Lang. Click on the "link" to go to share a favorite memory or leave a condolence message for the family.